A document can be edited by its owner and people with whom the owner shared it as Editors. Changes are auto-saved at regular times, but you can also use the Save command at any time. Note: In order for Readers to view or download the document, it must be published as a version. By default, the setting File > Publish Automatically creates a version each time you close the document. Owners and editors can create a version anytime by clicking File > Publish Now. Note: The Copy function is not available if you are using IBM Content Navigator. To save the document at any time, click File > Save. 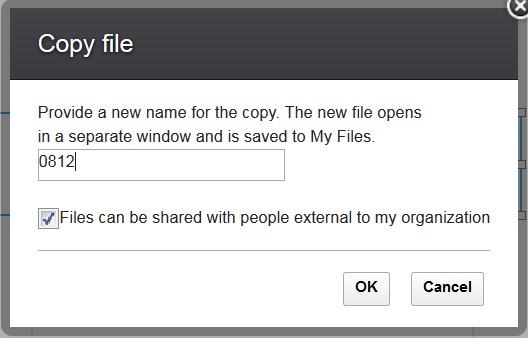 If you want to save the document with a different name, click File > Copy. Type a new file name and then click OK. The new document opens in a separate window and is saved in My Files. Note: If you use the Copy command to save a .doc, .docx, or .odt file, the file that is created still keeps its original format. For a .txt file, you can set a preferred format by clicking Tools > Preferences and then saving the file. Note: For IBM Content Navigator users, the Copy command is not available.